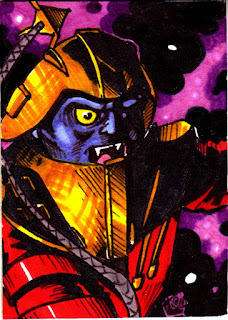 Taylor's Sweet Little Art and Nerd Site: Sketch Card of the Day- Flogg! Today's deviation is Flogg! Flogg, or Brakk, is the leader of the Space Mutants in the New Adventures of He-Man series. Working with Skeletor to take the heroic planet of Primus, Flogg uses his dim wits and whip to, well, try over and over again to take Primus. I remember seeing a Flogg action figure when I was young. He's pretty cool. I always wanted one, but never really got around to adding him to my collection. I'm not exactly sure why. He had this cool action feature of whip slapping power that made me wish it had been added to Beast Man years before! (It was a bit of waist twist paired with the arm drop.) I did think of Flogg as a pretty cruel hearted and brilliant leader, but the cartoon had different ideas with the evil space mutants that I had given a more serious characterization in my mind. When I finally saw the cartoon years later, I was a little disappointed in how Flogg was portrayed. Sometimes a bit silly is too much. C'est la vie. What can you do. You can also see this sketch card here.